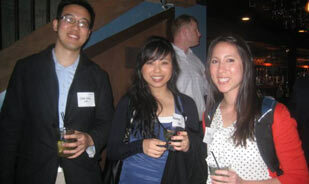 Bay Area Boalt and Haas alumni gathered recently for a happy hour at Taverna Aventine in San Francisco. View photos of the event here. Join hundreds of alumni, faculty and friends for a special evening celebrating Justice Kathryn Mickle Werdegar '62, recipient of the Judge D. Lowell and Barbara Jensen Public Service Award, and professor and former dean Herma Hill Kay, who will be recognized for her 50th year of teaching at Boalt. Speakers will include Elizabeth Cabraser '78, recipient of the ABA's 2010 Margaret Brent Women Lawyers of Achievement Award; Holly Fujie '78, incoming Alumni Association board president and immediate past-president of the California Bar Association; and Boalt professors and former deans Jesse Choper and Herma Hill Kay, with video remarks from Supreme Court Justice, Ruth Bader Ginsberg. RSVP online here and see who's coming here. Prior to the gala, join Ann O'Leary '05, Karen Skelton '92, Maria Echaveste '80, and Mary Ann Mason for a discussion on "The Shriver Report: A Woman's Nation Changes Everything." For more information, click here. These events will take place on Friday, April 30 at The InterContinental Hotel in San Francisco. Three of Boalt's most generous and distinguished supporters will be serving as Campaign for Boalt Hall co-chairs. Elizabeth Cabraser '78, Professor Pam Samuelson and Leo Pircher '57 have agreed to lend their energy and leadership to ensure that the momentum of the campaign continues through the second half to the $125 million goal. Thanks to the generous support of alumni and friends, the campaign has raised over $75 million, or 60 percent of our goal! Our 0 and 5 alumni are off to a great start with class committees solidifying and reunion gifts coming in. Our esteemed National Reunion Campaign Chairs, Fred Gregory '65 and Doug Wolf '70, anticipate a very successful year and are excited to lead such an outstanding group of fellow alumni. Check out committee lists, donor honor roles, class rosters, and all things reunion here. Reunions will be celebrated at Alumni Weekend on October 2nd. If you graduated in a year ending in 0 or 5 and would like to learn more about how to get involved with your class campaign, please contact Summer Staino at 510.642.9045 or sstaino@law.berkeley.edu. This unprecedented match, provided by the UC Foundation Board of Trustees, is coming to an end on June 30th. So far in fiscal year 2010, alumni and students from classes of '05 - '10 have made gifts exceeding $38,000, which translates to more than $150,000 in support for Boalt! As we approach the deadline for this remarkable giving opportunity, please support your law school by clicking here and know that this 3:1 match will quadruple the impact of your gift to Boalt. Make your gift today here! Special note to the Class of 2005: As the only reunion class eligible for this match, all gifts count toward your reunion campaign total! "I am so grateful for my Boalt degree. Ten years ago, I really had no idea where I would be now. Nor did I really understand the privilege of attending Boalt. Today, I can see that my Boalt degree has gotten my foot in the door many, many times. I can appreciate the incredible education. I look back in awe at the times I sat in those big, old classrooms, surrounded by the fearsome brainpower of my classmates and our professors. I am so excited to celebrate our reunion and attend some of the very cool events coming up. We need to step up big with our class gifts. These are tough times, and Boalt needs us to give back." The Wheeler Oak Meritorious Award is given to those alumni and friends who have excelled in a leadership position for one or more fundraising programs over a period of time. A former BHAA Board President, constant committee reunion participant, cabinet member and gracious event host, Ted is one of our most dedicated alumni. As a member of our Benefactor's Circle, Ted is also one of our most valued donors. The Young Bear Award is given to a current student, young alumnus, or friend who has demonstrated outstanding achievement on a fundraising project or campaign, or who has accomplished successful outreach to the community or alumni. As co-chairs of their class committee, Benson and Alisa were instrumental in raising over $110,000 for their 2009 5th Reunion Campaign. Combined, Alisa and Benson serve on the BHAA board, speak at and host events, participate in the Partners in Leadership program, and are all-around terrific Boalties. We can't wait to work with them again for their 10th reunion in 2014! Looking for a new job? Check out the Boalt alumni group on LinkedIn! Be in touch with over 1,000 members, post notes on the discussion board, and network! You can also stay connected to the Boalt alumni community through Facebook, Flickr and Twitter. A powerful human rights presence at UC Berkeley for 15 years, the Human Rights Center (HRC) has found a new home within Boalt. By adding HRC to its roster of multidisciplinary research centers, Dean Christopher Edley, Jr. says the law school is positioned to become "home to one of the nation's most comprehensive, globally active, and student-oriented human rights programs." Led since 1996 by faculty director Eric Stover, an adjunct professor of law and public health, HRC gathers and analyzes data to protect and expand core human rights--particularly in populations vulnerable to war, ethnic hatred, poverty, and exploitation. In doing so, the center works to pursue accountability for mass atrocities, address the needs of survivors, and strengthen the research and advocacy capacities of human rights groups. To read more about HRC, click here. Boalt's highly regarded Environmental Law program--the first in the country--has another feather in its cap this month after U.S. News and World Report ranked it the third-best environmental law program in the country. Founded by Professor Dan Farber, the program jumped up two spots in the rankings this year from number five in 2009. "It's great to see that the strength of our program is getting national recognition,'' Farber said. "This ranking is the fruit of a lot of hard work by our environmental law faculty and our new projects such as the Legal Planet blog, which has had over a quarter million viewings in its first year." Meanwhile, Boalt's Intellectual Property Program is back in the top spot. The magazine ranked the IP program number one in the country. This is the 12th time in the past 13 years that Boalt has had the top IP program among law schools. 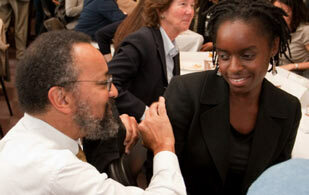 At a luncheon April 19, Atteeyah Hollie '10 received the Brian M. Sax Prize for Excellence in Clinical Advocacy. The prize is awarded annually to the graduating Boalt student who has best displayed excellence in advocacy and professional judgment on behalf of clients while participating in a legal clinic. At the East Bay Community Law Center (EBCLC), Hollie worked in the Clean Slate Practice providing legal services to low-income individuals with criminal records who are attempting to fully reenter society as productive members. At the Death Penalty Clinic, her work on an Alabama case focused on developing a claim against the prosecutor for using the majority of his peremptory challenges against prospective women jurors. A faculty committee selected Hollie from a group of nominees from Boalt's various clinics. Honorable mention went to Suzanne Martindale '10 for defending evictions and promoting housing rights at EBCLC's Housing Practice, Maile Padilla '10 for developing a client's life history at the Death Penalty Clinic, and Shane Witnov '10 for his work regarding law enforcement surveillance of social networking sites and online media privacy at the Samuelson Technology Law & Public Policy Clinic. Boalt Hall's LL.M. program is hitting new heights. For the 2010-2011 academic year, the program has surpassed its requested yield of 135 students, as 137 have been confirmed with more offers pending. Meanwhile, the Summer LL.M. program is preparing to welcome 38 new students--exactly double the size of last summer's inaugural class, which included 19 students from 12 countries. Those students will all soon return, and Boalt is scheduled to graduate its first Summer LL.M. class on July 30. Boalt's Chris Hoofnagle has been tapped to serve on the three-member board of the new Digital Trust Foundation, which will issue more than $6 million in grants to organizations that study online privacy. The foundation was created as part of a $9.5-million settlement of a class action lawsuit that targeted Facebook's Beacon program, which published information about Facebook users' buying habits. Read more here. >> Read more "In the News"
Q: When did Boalt Hall first start admitting women to the law school? A: Unlike Hastings, which at first had a men-only admissions policy, the law program at Berkeley has always been coeducational -- though that gender-neutral admissions policy did not go unchallenged. Continue reading. Make a difference in helping secure the future of the law school. Join fellow alumni and Dean of Admissions Edward Tom for a special reception with Boalt's newly admitted students. The receptions are Tuesday, April 20 at 6:30 pm in Washington, DC at the home of Ruth Greenspan Bell '67; and Thursday, April 22 at 6:30 pm in New York at Latham & Watkins, hosted by Warren Lilien '90. Sign up for the New York event here and the Washington, DC event here. April 27, April 28, and May 4: Discover Cal, "The New California Dream: Can We Fix the Golden State?" 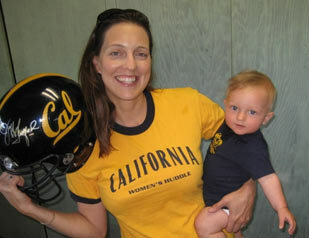 with Boalt Professor Maria Echaveste '80 Locations include Atherton, Santa Monica and Lafayette. Details here. The Berkeley Center on Health, Economic & Family Security presents a panel discussion with Ann O'Leary '05, Karen Skelton '92, Maria Echaveste '80 and Mary Ann Mason, who will highlight the The Shriver Report's findings and then discuss policy and societal impacts. The discussion will take place from 4:00-5:30 pm at the InterContinental Hotel in San Francisco prior to the Women's Celebration. For more information, click here. Join us for Boalt Hall's Celebration of Women Leaders, honoring two of Boalt's most accomplished women, California Supreme Court Justice Kathryn Mickle Werdegar '62 and Professor Herma Hill Kay. Register for the event here. This year's reunion of the International Association of Boalt Alumni will take place June 18-20 in Zurich, Switzerland. Click here to see the invitation and click here for the reunion program. For more information and to RSVP, please email Paul Peyrot at paul.peyrot@peyrot-schlegel.ch. Save the Date! October 1-2: Boalt Hall Alumni Weekend 2010 and Citation Award Dinner. Details here. McCabe: "I was reluctant to give up the freedom of private [solo] practice, although I sometimes joked that I was free to be a slave to it ... ."
Jackson: "I got started doing pro bono work . . . Access to justice for a clientele beset with personal, family, housing, employment and survival problems is, for many, the only experience of being treated fairly by the system ... ."
Read the full stories and other information about career development in the Career Corner at the CDO website. This free Webinar (live simulcast) via PLI and the State Bar featuring Hindi Greenberg, author of the best selling Lawyers Career Change Handbook runs from 9a.m. to 12:30 p.m. Click here for more information and registration. Alumni Career Services will present a program featuring Boalt alums who have made the transition from law firms and in-house corporate positions to public interest and public sector work. Hosted by Pillsbury Winthrop Shaw Pittman, 50 Fremont Street, 6th floor, San Francisco, the event runs from 6-7 p.m. See the CDO events calendar for details. RSVP by June 8th to Robert White, Director of Alumni Career Services at rwhite@law.berkeley.edu. Class Notes has been redesigned! Keep your fellow alums up-to-date with your important life changes by submitting a Class Note. To submit a class note, you will need to use your AlumNetwork ID and password. If you do not have your ID, email alumni@law.berkeley.edu. We'll publish your news on the web and/or the alumni magazine, Transcript. You can also browse current class notes here. Joseph Aidlin, who will turn 100 this month, is the oldest practicing lawyer in California. Over the past seven-and-a-half decades, Aidlin's law practice has included family law cases such as divorce and wills as well as corporate cases. He has also been involved in geo-thermal energy through a business that he founded. Read the article here. The Honorable Harry Pregerson is the recipient of the Peter E. Haas Public Service Award. Judge Pregerson was selected in recognition of his remarkable dedication to the homeless women and men in the Los Angeles Community. His leadership to fight homelessness exemplifies the fundamental values of the award. The award ceremony will be held on Friday, April 30 at 4 p.m. in Sibley Auditorium and is open and free to the public. For more information, click here. The Honorable Kelvin D. Filer was honored on February 27 by the Compton Chamber of Commerce during Black History Month as one of the first African-Americans from the City of Compton to be appointed to the position of LA Superior Court Judge. Jose H. Varela was recently named the public defender in Marin and will now oversee 44 employees and a budget of $7 million in an office that provides legal defense for suspects who cannot afford to defend themselves. He previously served as assistant public defender since 2001, and was a deputy public defender in Los Angeles and San Diego counties before joining the Marin department. Elizabeth J. Cabraser was selected by the American Bar Association Commission on Women in the Profession to receive a 2010 Margaret Brent Women Lawyers of Achievement Award. The award recognizes and celebrates the accomplishments of women lawyers who have excelled in their field and have paved the way to success for other women lawyers. Elizabeth will receive the award at this year's ABA convention in San Francisco on August 8. She will also be a featured speaker at Boalt's upcoming Celebration of Women Leaders on Friday, April 30. Kenneth J. Fishbach is delighted to be nearing three years as Senior Counsel in Chevron U.S.A.'s Law Department in San Ramon, where he applies his extensive real estate expertise to a wide range of transactions. Ken says he has "sat in most seats around the conference table" of real property transaction players, from land assembly to land use approvals to commercial real property purchases and sales, leases, easements and beyond. Mark S. Siegel has been elected to serve as Chair of the J. Paul Getty Trust Board of Trustees effective July 1, 2010. Mark joined the Board in November 2005, and currently serves as Chair of the Investment Committee and is a member of both the Governance and Compensation committees. He also is a member of the Getty Museum's Conservation and Villa councils. Scott A. Edelman, Rachel B. Hooper, Karen B. Musalo, and Sky C. Stanfield have been honored with California Lawyer magazine's 2010 Attorney of the Year (CLAY) Award. Read more about the awards here. Yuichiro Tsuji, Faculty of Law at Surugadai University in Tokyo, invited Judge William A. Fletcher and Boalt Professor Richard W. Jennings to Japan in March 2010. Judge Fletcher, United States Court of Appeals for the Ninth Circuit, gave two talks: "Protection of Speech under the First Amendment to the United States Constitution" at Waseda University; and "The Structure of the American Judiciary and the Appointment of Judges" at Okayama University. Yuichiro is in charge of public law for Boalt and Japanese professors.